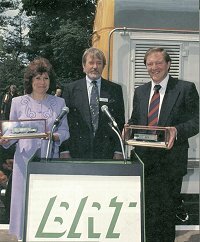 With the forthcoming privatisation of the British railway system, the telecomms subsidiary of the British Railways Board decided to purchase its own fleet of locomotives. All the rolling stock and motive power were being divested to the train leasing companies and freight operators. It was felt that owning the motive power was essential to keep the programme of cable laying on target, avoiding the need to book locos months in advance. 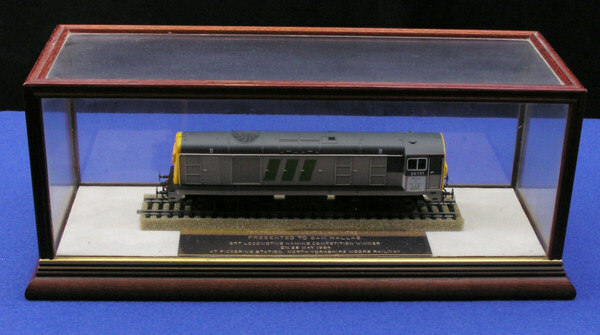 Cable laying demands a loco fitted with special low-speed running controls. A fleet of four Class 20 locos was bought and these were refurbished and painted in the new BRT livery. 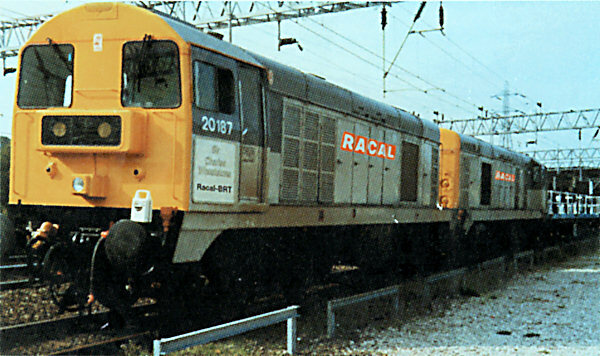 A competition was launched within the company to find names for the locos. 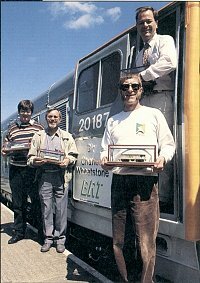 The winners of the competition were invited to a naming ceremony on the North Yorks Moors Railway. I was one of the lucky four to be invited - even though my exact choice of names hadn't been used. The names chosen were: Sir William Cooke and Sir Charles Wheatstone - figures important in the history of railway telecomms; Guglielmo Marconi - for his pioneering work in the field of radio; and Almon B. Strowger - the inventor of the automatic telephone exchange. I seem to recall that I had chosen three of the four finalists, but had replaced Cooke with Alan Blumlein, the inter-war genius behind many developments in data communications, audio, television, etc. 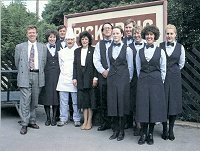 The following article is taken from BRT Newsline, The house journal of BR Telecommunications Ltd for September 1994, Issue No 14. Story by Gary Spendlove. Picture: The double-headed Wheatstone and Cooke powers through the beautiful Yorkshire countryside en route to Grosmont. Click on the images for a larger view. 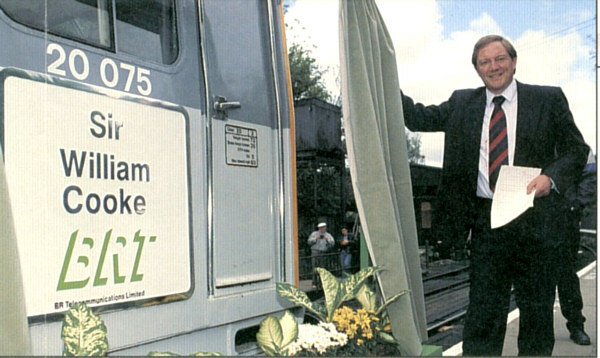 A LOCOMOTIVE naming is big news for railway enthusiasts. 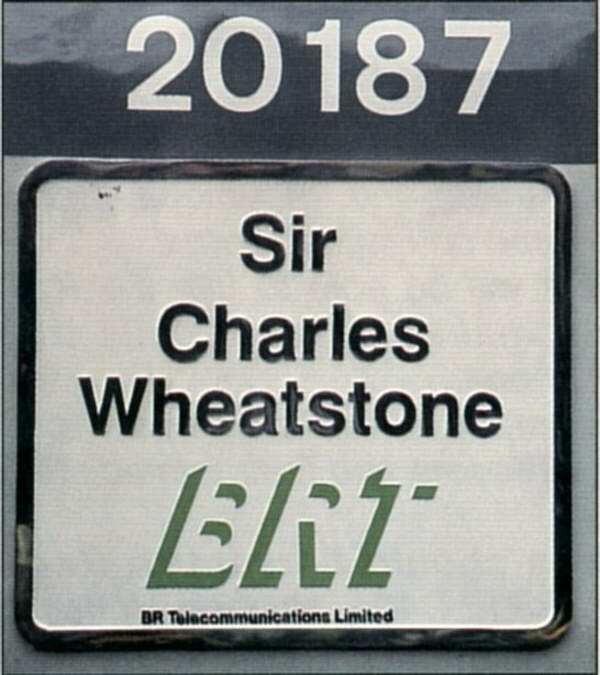 Even before we had named 'Almon B Strowger' at Waterloo in March, the North Yorkshire Moors Railway (NYMR) invited BRT to consider naming 'Sir Charles Wheatstone' and 'Sir William Cooke' on their private railway - the stage was set. 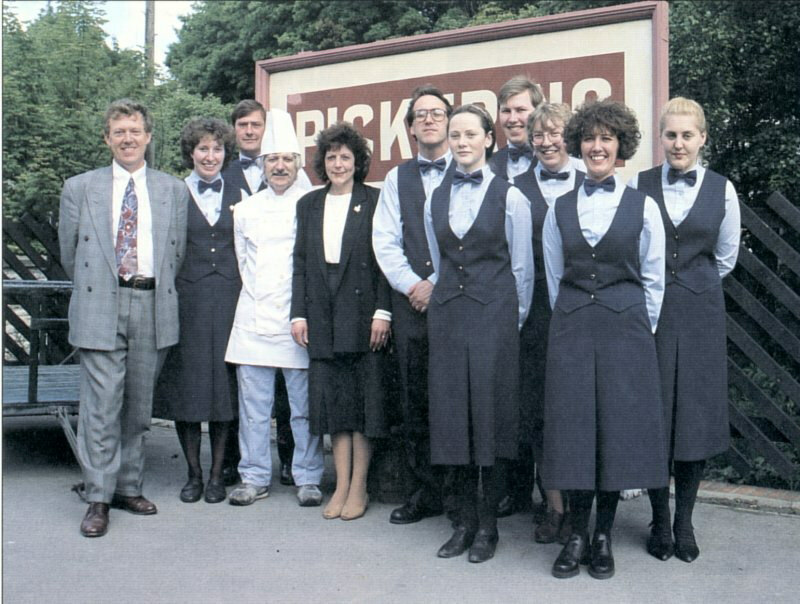 After the ceremony, the dignitaries and BRT guests, bringing together staff, families and friends from as far afield as Manchester and Croydon, enjoyed the unashamed luxury of Pullman accommodation over a return journey between Pickering and Grosmont, courtesy of the NYMR. A double headed 'Wheatstone' and 'Cooke' hauled the special service, during which lunch was served. The NYMR runs through some very beautiful countryside and the excellent weather ensured that we all appreciated the scenery as we passed through - a great setting for Wheatstone and Cooke's inaugural trip. Sadly, we arrived back at Pickering all too soon. It had been a wonderful day out, which would not have been possible without the kind help and support of the NYMR staff, in particular, David Prescot, Operations Supervisor; Chris Hudson, Marketing Manager; and Pam Jones and her catering staff for providing such fine fare. Sir Charles Wheatstone was born in Gloucester in 1802. He went on to become the Chairman of Experimental Physics at King's College, London. Wheatstone was the first to determine the velocity of electric waves in metallic conductors and one of the first to recognise the practical measurement of resistance - the 'Wheatstone Bridge' - which is still in use today. 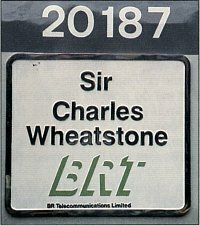 Wheatstone will be remembered in the telecomms field for his work on the electric telegraph and his patents on the 2 and 5 needle telegraphs. Wheatstone took his practical ideas to, and entered into partnership with Sir William Cooke. Sir William Cooke was born in Ealing in 1806. He recognised the practical applications of the electric telegraph for railway signalling and persuaded the railway companies of the day to experiment in its use. 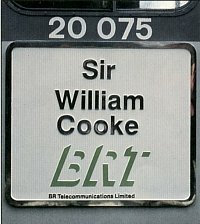 In 1846 Cooke formed the Electro-Telegraph Company, after buying out Wheatstone's patents and agreeing to pay him a royalty for each mile of telegraph cable laid. 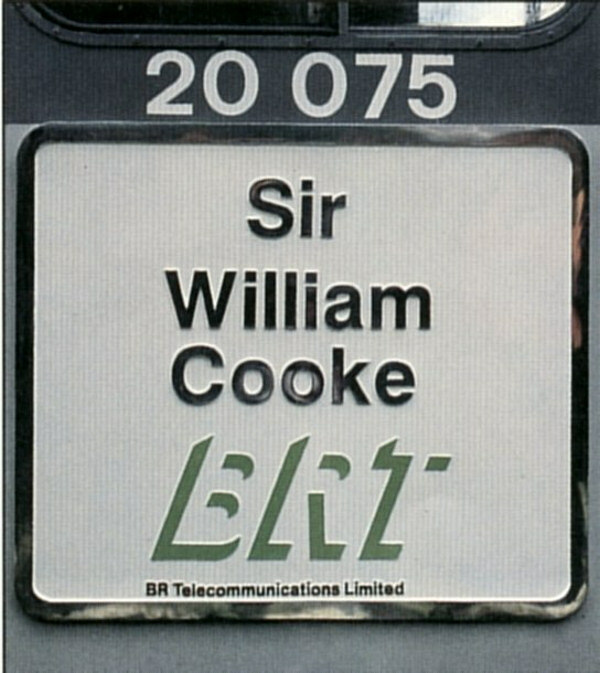 It was Cooke's practical application of telegraphic systems for the railway that set the foundations for BRT's networks. 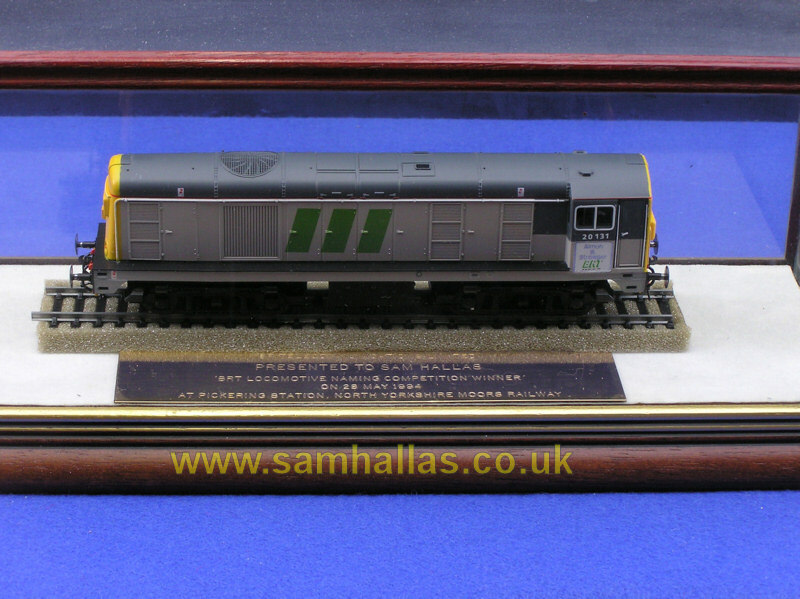 In January 2002 a member of the Strowger mailing list noticed on e-Bay a new and boxed Lima model, similar to the ones presented above, with the name Almon B. Strowger. I undertook to find out what had happened to the original locos. Thanks to Andy Lickfold, formerly of EWS, and his contacts I can report as follows. By the way, I still have my model, in its glass case. Your article reminded me that I had a print of 2 of the Racal locos in my filing cabinet [which] used to pinned on Ben Jenks' office wall. Ben was responsible for the BRT/RACAL cable laying fleet including organising both movements and maintenance and was based at Crewe. Originally he worked for Charles Devereux who in turn was responsible during privatisation for securing the locos and literally hiding them in a disused tunnel so that no other part of the fracturing BRB was reminded of their existence. They might well have argued that as a non-train operator BRT shouldn't have them. .... They - and Ben - subsequently became my responsibility. We actually had about 12 of the beasts, but only 4 were ever made operational. The maintenance costs were horrendous and because they were riddled with asbestos the cost of scrapping the rest was going to be even worse. Two of the 4 developed quite serious problems and it was decided that it would be uneconomical to repair them. We continued to use 2 intermittently for a time but the increasing use of optical fibre cable that could be hauled out by hand made them less and less necessary and I was told to sell them. I sold the 2 that were of any use at all to DRS in either 1996 or 1997. By that time only one was fully operational; the second needed some expensive repair work which DRS undertook after purchase. Why did they want them? Because they were exceptionally low geared; the same attribute that made them ideal for cable laying. I finally got round to photorgaphing it in 2012. Here it is. 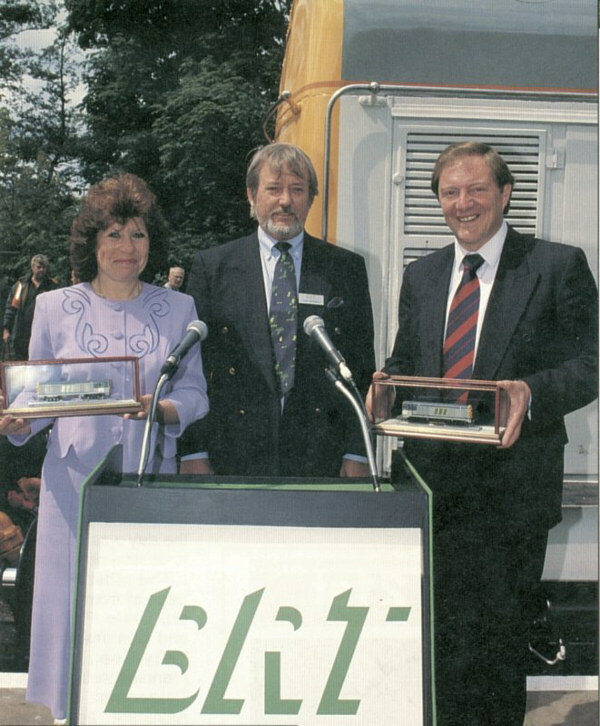 The inscription reads "Presented to Sam Hallas, BRT naming competition winner on 28 May 1994 at Pickering Station, North Yorkshire Moors Railway."